Hospitality has been a large part of the culture of the UMass Boston Interfaith Campus Ministry. The first space dedicated to campus ministry on the University of Massachusetts-Boston campus was in the Healey Library. 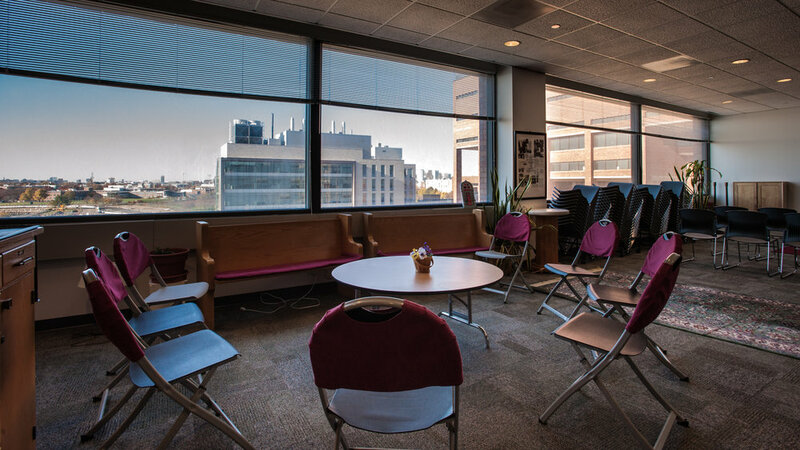 This space was set-up with cubicles for campus ministers and chaplains. Sister Sarah Small, an American Baptist lay person, had planted the ecumenical Christian ministry at UMass Boston with Rev. Jack Hornfeldt in 1974. They were joined by chaplains from the Catholic Archdiocese of Boston, the Greek Orthodox tradition, and the Jewish tradition. It was difficult for the chaplains to perform all of the services needed in their small space. Mrs. Small and Father James Rafferty were given permission to look for a new space. They discovered the current space off the upper level of the Ryan Lounge on the third floor of McCormack Hall. The university underwrote a fundraiser led by the chaplains to fund renovations. With a new wall filled with glass windows and blue curtains, two new offices, and white oak pews and furniture donated from a convent sanctuary that was blessed and placed into service, the new sanctuary came to life. It was just down the hall from a cafeteria which made gathering students for programming even easier. Over the years a large rug for the space was donated by a Catholic Campus Minister layperson, Dr. Aldona Lingertat, Ph.D., for the Muslim students’ prayer. Later on, ten small rugs were donated by Catholic Campus Minister layperson Maggie Cahill. Other additions and changes came: folding chairs, and an adjustable table for group study, group discussions, celebration hospitality, and a place to display a focal point for meditation. In 2015, the Center received several religious items including the multi-colored glass dove of peace and the prayer-encouraging carved statue from the Sherborn Peace Abby through founder Lewis M. Randa. More recently, students requested a more flexible space that met the needs for worship and meditation that happens at floor level. Architects were hired and the Student Government and university financed the changes. Stackable chairs, new cabinets, more new blinds on the windows, new curtains at the front frieze, a large monitor with computer connections and wall mounted speakers improved the use of the sanctuary for this multicultural, multi-faith generation. The sanctuary was re-dedicated on Wednesday, May 20, 2015 with votives and community shared prayers, blessings and hopes. In 2015 the Muslim community also gained a new larger and more permanent space for prayer. 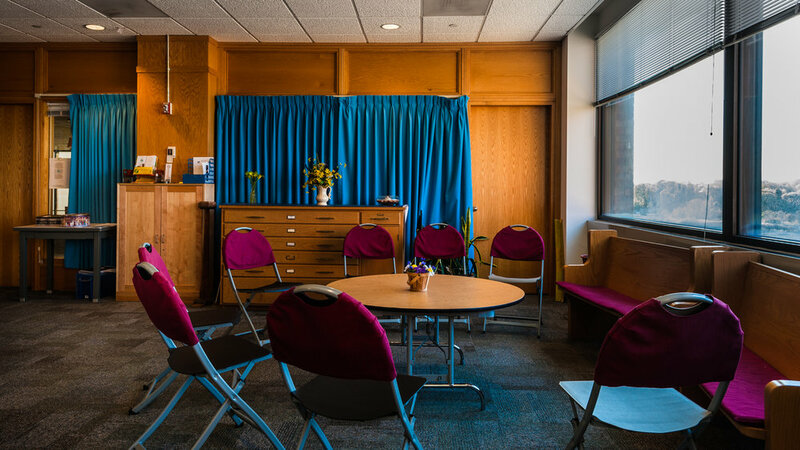 An office on the fourth floor of McCormack Hall had been a space for prayer for many years but the community had outgrown it. With partitions and an university-wide agreement, the Muslim prayer space adjacent to the ICM Sanctuary was established. On Fridays the spaces open up to accommodate all who gather for prayer. The sacred spaces serve the community well. “We always hope that those who enter in find welcome, hospitality, and the peaceful, embracing energy” reflected Adrienne Berry-Burton, campus chaplain.